Brainwashed - Mike Shiflet, "Tetracosa Volume 1-4"
Mike Shiflet, "Tetracosa Volume 1-4"
Ohio legend Mike Shiflet has unquestionably had a lengthy and fascinating career as an experimental guitarist and electronics specialist with a multitude of diverse, exceptional releases since the early part of the century. This year, however, he has embarked on his most ambitious project to date. 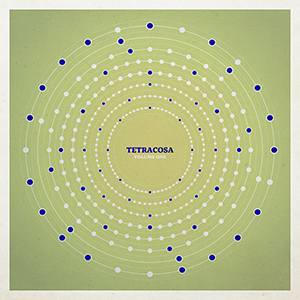 The Tetracosa series is an eight part, 24-hour-long project being released monthly in three hour segments, with the first four currently available. While it seems at first a daunting project, it is anything but, and so far it is an exceptional piece of work that is engaging on a multitude of levels. Besides the long-form concept behind Tetracosa, Shiflet applies some specific tactics to the structuring of these pieces. The entire series is constructed from some 350 different "sound objects," recorded entirely independent from one another, that act as the building blocks of the compositions. Shiflet then pieced them together with the assistance of random number generation, resulting in these expansive walls of sound that seem both the product of chance, but also an overarching sense of structure and cohesion that clearly comes through. Because of the width and breadth of these pieces, Shiflet clearly put in significant effort to generate the sounds that make up these pieces and in doing so draws from every facet of his diverse repertoire. Right from the opening moments of Volume One's "00:00:00.00" (all pieces are just titled as time codes), a shimmering guitar drone clearly bears his mark: a droning, sustained passage that is undeniably the work of Mike Shiflet. This first volume is a bit more guitar-centric, appearing in echoing walls throughout the beginning of "00:24:06.00" and a bit more devoid of processing and effects on "00:46:09.04." The final parts of Volume Two's "05:45:40.50" also feature him wielding the instrument, in this case in the form of a nicely distorted buzz. With his pairing of texture and guitar, I could not help but be reminded of some of Robert Hampson's best work, both solo and in Main. Various electronics are another recurring theme throughout this first half of the Tetracosa project. Within Volume Three and Four it is especially prominent, such as the deep resonating drone that opens "06:23:23.96," which is more of an exercise in restraint, ending on an almost conventionally sounding synth passage. This transitions brilliantly into "06:44:13.33," although with the added chaos of feedback and guitar. Eventually though the melodic electronics take the forefront, underscoring everything as the surrounding sounds become more and more disjointed, making for an amazingly diverse sounding piece. In a less pleasant manner, the electronics (and maybe field recordings) throughout "09:12:52.21" on Volume Four are more distorted overall, taking the form of sputtering crackle and buzz, and eventually a hollow machinery hum that gives some classically industrial vibes to the sound. It also would not be a Mike Shiflet work if he did not integrate some more traditional, old school noise elements into his work, and those appear weaved in brilliantly throughout these first four volumes. The peaceful electronics that appear early in "00:24:06.00" eventually give way to a high-pitched cacophony of scrapes and pings that is not far removed from the din of a pachinko hall. Later, the second half of "04:01:29.95" from Volume Two is a dusty mass of brittle, crackling electronics that reside clearly in the shrill end of the sonic spectrum. The digitally crushed sound and clatter of "06:12:04.28," on Volume Three, at first becomes a nice blend of noise and tone, but soon decays into the sharp crackling of an old school overdriven noise wall. Twelve hours of often abstract, sometimes painful sound may sound imposing superficially, but that ends not up not at all being the case. Mike Shiflet's approach to structuring this work really adds a lot of depth and variation. Sure, it can be heard in the three hour blocks it is being released in, and that approach really showcases his use of recurring themes and sounds that are peppered throughout each volume. But each piece can also be enjoyed individually in their roughly eight to twenty minute durations. Even in such a massive, complexly structured work such as this, each segment stands on its own as an individual composition as well. Nothing feels like filler or an incidental, transitory piece that simply bridges two other pieces of music. I imagine experiencing the full work once all eight parts are released also gives a further defining facet to Tetracosa, though I think that experience will take some specific scheduling and planning to fully appreciate.